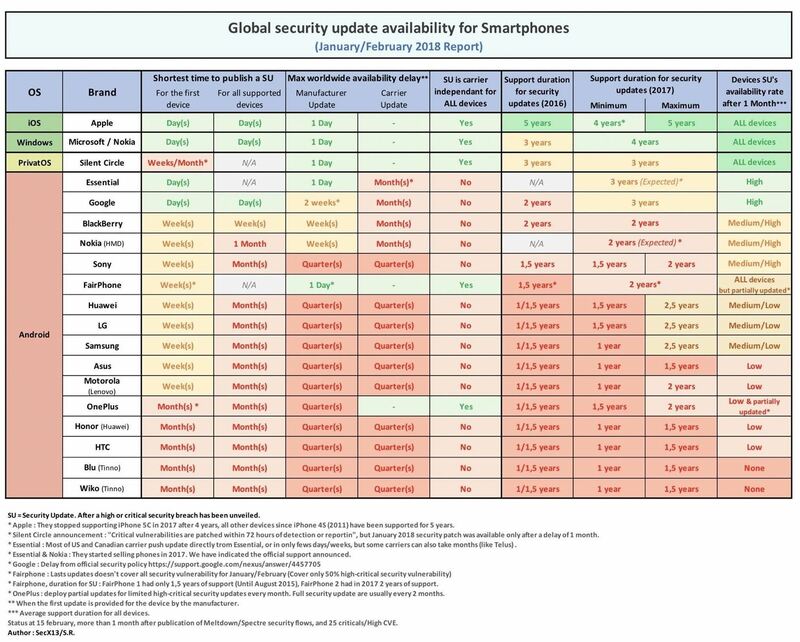 As far as overall security updates are concerned, we all know that iOS reigns supreme over Android. But just how bad do Android devices fare against Apple in general? A recent report will have you second guessing some companies the next time you're in the market for a handset. A report by SecurityLab has just surfaced, highlighting the overall disparity between Apple and major Android OEMs when it comes to releasing security patches in a timely manner. Impressively, Windows devices are issued updates at a speed that's on par with Apple. Android, unsurprisingly, lags behind its major competitor. What's shocking however, is just how slowly some OEMs are pushing out patches. The above report was compiled during January and February 2018. As you can see, Apple only takes days to issue critical security fixes to iOS, while most Android OEMs take weeks or even months. Unsurprisingly, the only OEMs to issue Android security updates within days were Google and Essential — the company that runs Android, and the company headed by the guy who created Android, respectively. These particular updates were even more important than usual — they're the ones that patched the vicious Meltdown and Spectre bugs. OEMs like LG and Samsung took 1–4 weeks to issue security updates in this time frame, though that was just for the first device they updated — both companies have yet to issue the updates to their entire lineup of phones. In fact, the only companies that appear to have updated their full lineup of phones so far are Essential, Google, BlackBerry, and Nokia. Among the major brands with a presence in the US, HTC seems to have fared the worst, with OnePlus hot on their heels. Both OEMs took month(s) to issue the January and February security patches, while all other major US OEMs had the updates shipped out within weeks. It's particularly hard to justify a timeframe spanning months for OnePlus, who has a smaller handset selection than HTC, and as an unlocked-only brand, doesn't have to wait on carrier approval for updates. What are your thoughts? Chime in on the current state of Android security updates below.